Our Blog this week focuses on how to overcome the most common problems therapistswill encounter when applying extensions or that clients may report inmaintaining their nail extensions. Ensure you apply to UV Gel in thin coats, using no more than 3 layers of the UV Gel. When applying Acrylic ensure you follow the 3 Zone Application Technique to ensure you are correctly shaping the nails and avoid applying to big a bead of acrylic with each zone as this will leave the nails too thick as the acrylic dries. This usually indicates that the prep stage of application was not thorough enough. It may that eponychium was left on the nail plate, nails were not dehydrated with a bonder or degreaser before applying product or that moisture was in the nails when the extensions were applied (do not soak nails before applying extensions). This can be caused by a number of things. Most commontly, the nail tip that has been selected and applied is too small which means the nail is flattened when glued to the nail and works against the natural curve of the nails. 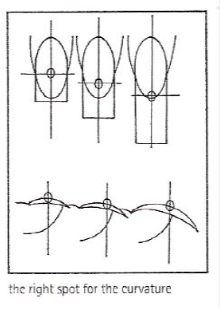 This means the tip can snap or come away when put under any kind of pressure. It may also be due to air bubbles then the glue was applied to the tip which does not give a secure bond. Alternatively the UV Gel or Acrylic product may have been applied too thickly which limits the nails ability to flex under normal conditions and pressure. Also check where you have made the ‘curvature’ or apex point to ensure it is correctly placed to allow the extension to endure reasonable pressure. This usually occurs where the finishing stage has not been completed fully. 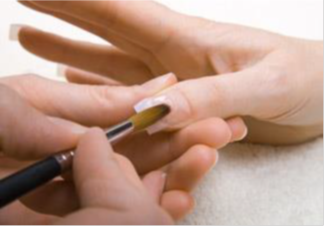 It is important to ensure you ‘bed the nails in’ by ensuring there is no UV Gel or Acrylic product left on the skin, no rough edges by the nail folds which could catch during normal wear. It is important also to ensure the product has not been applied to thickly as this will limit the nail extensions flexibility causing the extension to work against the natural curve of the nail and can lead to lifting under normal pressure. Also ensure the nails are finished to a suitable shape and length for your clients lifestyle (the more rounded the nail tip and the shorter it is finished, the less likely it is to catch and lift). 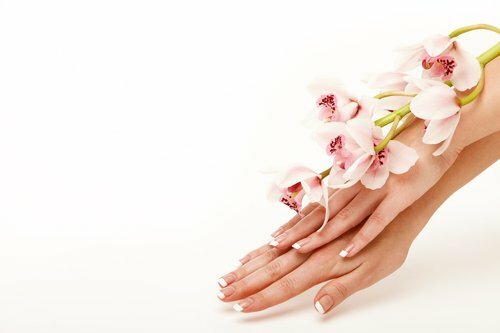 Providing nail extensions to these kinds of clients will not usually lead to repeat business and can damage your reputation as such clients might not return to the salon for the correct removal which could damage their natural nails. Try to recommend such clients to book for an appointment as soon before the event as possible to allow their natural nails time to improve through natural treatments or even gel polish. If the client particularly wants to have an extension, explain the importance of correct removal of the extensions and ensure you arrange an appointment for removal before the leave the first appointment. Review their consultation – check they do not have any conditions which affect hormones like pregnancy or menopause, that they are not taking anti-depressants, that they do not spend prolonged periods in hot water such as washing up or long baths, that they don’t use calcium-removing or glass cleaning products at work (e.g. hospital or catering work). Harsh treatment of nails such as those who engage in racket sports, gardening, outdoor pursuits etc. Those who are nail biters. Using nails as tools and not jewels. If it just one client from your client base you is having an issue, it usually suggests their is an issue in their lifestyle, medical history or in failure to follow home care advice. Ask the client if they are using the nails are tools and not jewels, using the nails to open things such as ring pulls on cans can cause too much pressure on the nail extension and cause breakage or lifting from the cuticle area. Advise the client to use the end of a spoon to open ring pulls etc and never use the nails to pick at anything such as labels. Client regularly experiences lifting of several nails within days of their period. Some clients are very sensitive to hormonal changes and these changes can cause an increase in sebum production in the skin which can cause lifting to the nails. Such clients are advised to have more regular maintenance perhaps timed around their cycle. The client has entirely lost a nail extension and injured the natural nail underneath. 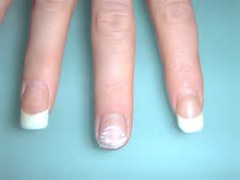 This is usually caused by an extreme knock or damage to the nails. However it can also be a sign that the client has very weak natural nails. Acrylic is a much harder system than UV Gel which tends to have somewhat greater flexibility and a more gentle adhesion to the natural nail (usually resulting in less damage if the client does damage a nail). Recommend the client to have the extensions removed and natural nail service until the nails are healed (do not work on any cut or bruised nails however). If the client has fractured the extension which will cause pain (usually due to a severe knock or blow), ensure the client returns to you asap for a repair service. 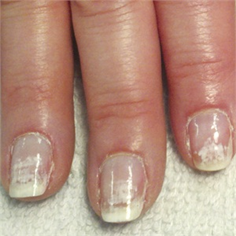 Ask the client to apply some colour-less iodine to the nail and apply a plaster to cover the nail. It is recommended you do not remove the nail extension if fractured, but repair carefully with fibreglass and resin to help bring the fracture together and allow the damage to grow out. Take care not to open the fracture when applying the fibreglass and resin but to keep the fracture together so that resin does not enter the fracture. 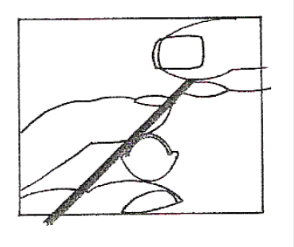 Repair in this way will significantly reduce pain for the client and encourage the nail to grow out the damage. It can then be removed at the next nail service provided the fracture has grown sufficiently down the nail extension towards the free edge. If in any doubt or there is any kind of bleeding, swelling or signs of infection, refer the client to a medical professional for advice. The most common reason for the breaking or tearing of artificial nails is that the customer hits the nail too hard or if the fingertip slips from a surface. In practice, customers say they do not know how the nail was broken. The “did nothing wrong, suddenly the nail was gone”. In this situation, check carefully how the nail is broken. If the nail has broken at the stress point, and the free edge is missing, the nail will have impacted directly with some form of surface. If the nail has broken off at the stress point and part of the plastic layer on top of the nail has also disappeared then the customers nail slipped off some surface. If there is no trace whatsoever of the artificial nail left on the natural nail, then the customer not only broke the nail, but also picked off the remainder. 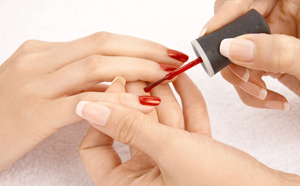 Fortunately these problems can be easily solved; first by filing away the remainder of the artificial nail, and then applying a new artificial nail. Some nail technicians will offer the first repair free of charge and just charge for any subsequent repairs (which should be a rare occurence) until the next maintenance treatment. Others will charge a small fee per nail that requires repair. Other nail technicians might charge per nail to be repaired but then offer this amount as a discount against their next maintenance treatment which ensures they continue to rebook with you for nail services. Provided you handle the customer experience positively by asking how they experienced the break or when they became aware of it, you can then tailor advice to help them protect against future nail breaks. Clients should return to have the regrowth section infilled every 2-3 weeks. Some clients may be able to have a longer duration between maintenance treatments however a greater level of maintenance will be required if clients return only every 4-6 weeks as you will need to also rebalance the stress point of the nails and infill the regrowth area. Clients who do not have regular maintenance risk damage to the extensions and therefore potentially damage to their natural nails. Clients must agree to commit to the maintenance involved with extensions and should be booked in for a maintenance appointment before the leave their first appointment to ensure this is adhered to. It is not recommended to continue to offer nail extension treatments to clients who cannot commit to the time or cost of regular appointments. 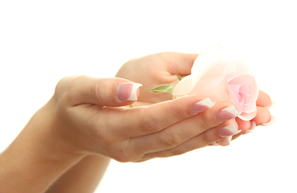 Those who simply want occasional or less frequent appointments may be recommended to natural nail treatments. Gel Polish will still grow out after 2-3 weeks however is unlikely to damage nails if left for longer durations than extensions and may be a suitable alternative provided it is removed correctly. You could retail a home removal kit for UV Gel Polish for such clients.